I am very excited to announce my next concert with SONIC LiQUID in the “Theater im Walzwerk” in Pulheim, Germany (Saturday, 28th April 2018, doors – 7:30 pm). We will perform with 3 other bands (BLIXT & BROTHERS, DOGHUNTERS, DRUCKPHASE). I suppose that the order of the bands will be determined just before the show as usual – I will let you know! NEW: I have now implemented a music player with some of my songs in my blog – check it out!! While checking my Youtube channel, I stumbled over a slide show of pictures reflecting the last years with my music. You’ll see some pics of my former band “Backporch Stringband” (–> Bluegrass Music) in Sindelfingen, pictures in the ARTheater in Cologne during the show “Kunst gegen Bares” with or without Hildegart Scholten ( 🙂 –> many regards! 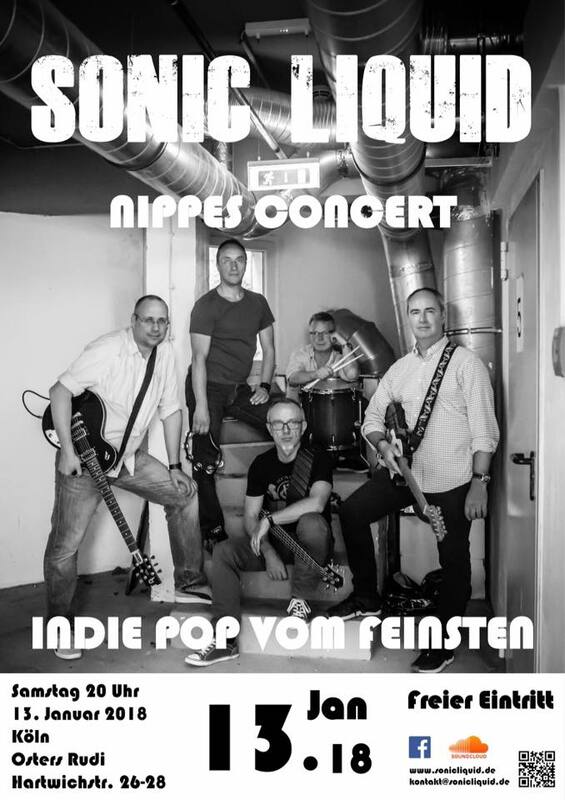 ), on the “Fete de la Musique” in Cologne (–> Singer/Songwriter) and last but not least with “SONIC LiQUID” (–> Rock Music). Music was recorded live with my hard disk recorder at a jam session with the “Backporch Stringband” (not perfect, but I like it!). I wrote the song “You don’t say a word” some years ago. The last concert with SONIC LiQUID in the Rockin’ Rooster Club in Haan, Germany was fun! Just look at the black & white photos (Thank you very much Michael Clemens)! So what do you think? Next concert will be in Pulheim, Walzwerk, 28th April 2018 – I will let you know! I am very pleased and excited to announce my concert with SONIC LiQUID in the Rockin’ Rooster Club in Haan, Germany today evening (doors – 7:30 pm). 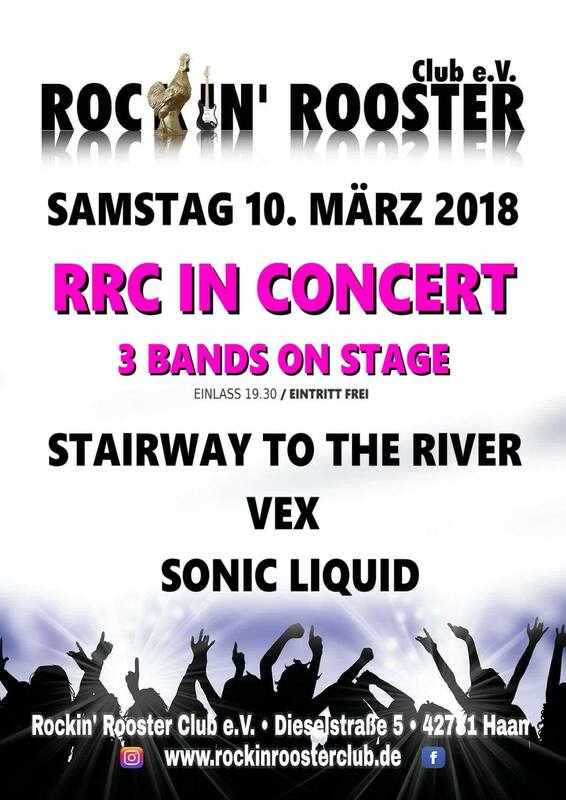 We will perform with 2 other bands (Stairway to the River and VEX) – 45 mins per band. The order of the bands will be determined just before the show. Let’s see and have fun!!! These pictures were taken at my last concert with SONIC LiQUID (13th January 2018, Osters Rudi, Köln, Nippes). I will publish a slide show with the whole band and some music soon! I am very pleased to announce my next concert with SONIC LiQUID this Saturday, 13th of January 2018 in Cologne. This will be a very special evening, as we will perform and celebrate with and for all our friends and fans and everyone who is open to new music. We are very excited to welcome you all and therefore we decided that the entry is free. You could donate some money to support our CD which we are working on – if you like! Let’s have fun and celebrate this Saturday night! Let’s see if this will be all :-). I wish you all a merry Christmas and a happy new year. Let’s see what the new year will bring for all of us. I stumbled over these 2 videos which where recorded at the same show “Kunst gegen Bares” in the ARTheater Cologne 3 years ago. I had fun and I hope you too!